Sand Stream (also Mega Ability) - Summons sandstorm when the user enters battle. Lasts for 5 turns, and 7 turns with Smooth Rock. Unnerve - As long as the user is in battle, the opponent can not eat its held Berry. The roar you hear right now is not from the new Godzilla movie. It's the Godzilla of the Pokémon world smashing through OU of 5 consecutive Generations. 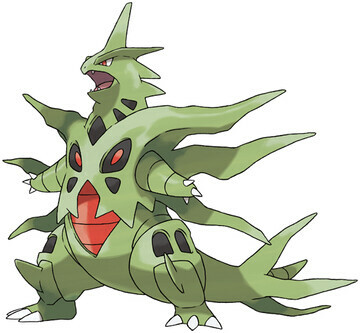 Tyranitar has always been a top-tier threat, be it offensively with gargantuan Attack with usable Special Attack, a mixed tank that can take hits and retaliate back, or simply an overall team supporter with the perfect combination of offensive and defensive presence. Even though this Pseudo-Legendary from Johto has whopping 7 weaknesses, it has amazing bulk with helpful resistances, especially when its Special Defense increases by 1.5 during a Sandstorm, which, is always. Added with the ability of summoning instant weather, Tyranitar has more than many reasons for being consistently used in Top 10/ 15 of OU since GSC days. • Breath-taking 134 Attack, with STAB Stone Edge, Pursuit and Crunch to destroy opposition. Better with the help of an extensive Physical movepool including Earthquake, Fire/ Thunder/ Ice Punch, Superpower, Aqua Tail etc. • 100/ 110/ 100 bulk with +1 SpD during Sandstorm from Sand Stream, meaning gigantic bulk. • The stats only get better with Mega Tyranitar. 164 Attack with 100/ 150/ 120 bulk, and then, Sandstorm’s SpD boost. Blissey with armor, anyone? • Tyranitar’s Dark STAB is better in 6th Gen due to Steel losing resistance to Dark. • 95 SpA stat is extremely useful with Tyranitar’s myriad of Special offense: Dark Pulse, Thunderbolt, Ice Beam, Flamethrower, Focus Blast, Earth Power, Surf etc. • This pseudo-legendary also has considerable support moves such as Stealth Rock, Thunder Wave, Taunt, or set-up moves such as Dragon Dance, Rock Polish, Curse or Hone Claws. • Can use a wide range of different items really well. Other than Tyranitarite, a regular Tyranitar can opt for Leftovers, Assault Vest, Choice Band, Choice Scarf, Life Orb or even Smooth Rock. • Can counter common threats such as Talonflame and Special Attackers such as Greninja, Lati@s, Gengar, Alakazam etc like the monster that it is. • Vast usability makes the dinosaur a very unpredictable opponent. • Rock/ Dark has 7 weaknesses, the most out of any Pokémon. This includes a x4 weakness to one of the most common offensive type: Fighting. • Tyranitar’s only bad stat is its low Speed, which hinders it from being fast enough to hurt the attackers before being KO’d first. • Weather-summoning Abilities’ new nerf means that Sand Stream won’t summon infinite Sandstorm anymore. • Doesn’t have any sort of recovery except Rest and Leftovers. where are the move sets?